Last Sunday I was looking through Ellen Gilchrist’s Falling Through Space trying to find the passage where she writes about getting down on the floor to play with her books. Well, I couldn’t find it, but in the process, I discovered that Falling Through Space had been republished in 2000 with the addition of fifteen new essays. I ordered a new copy. It came yesterday, and I read the whole book again. I couldn’t stop. I love the way she writes, her honesty, her outlook on life. I may read it again today. I found the passage, by the way. Apparently she had said on a radio program that “we should all learn from two-year-olds and go to work by different routes and take all our books off the shelves and throw them on the floor and play with them.” She writes, “I can talk a good game but where is the action.” Then, “…I walked on home and went into my house and started pullng all the books off my bookshelves and piling them up on the living-room floor. Pretty soon I had a carpet of books.” She describes it as “one of the best weekends I’ve ever had.” This process of “being into everything” is so important to her that she mentions playing with books again later in the book. That’s what writing here is like for me: playing with books. It’s as if the books are jumping off the shelves. Write about me, each one is saying as it takes a leap into the air. 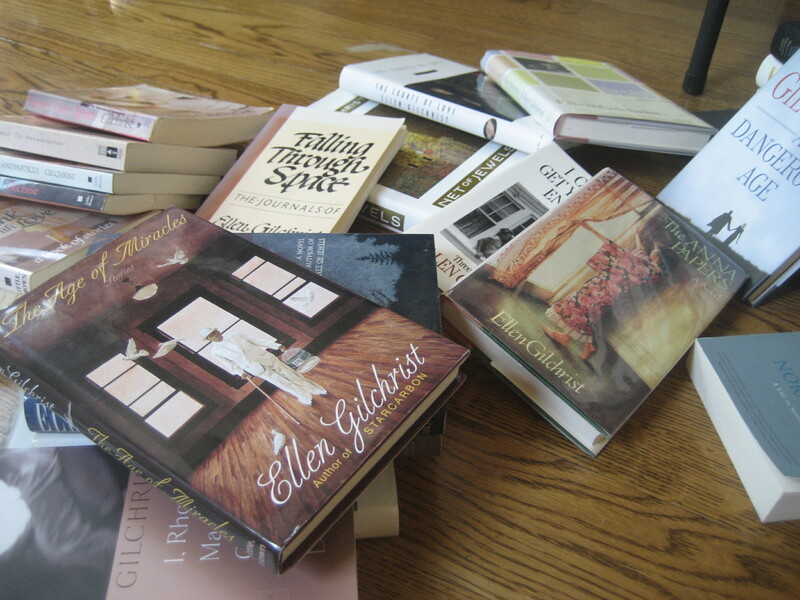 This morning I remember Ellen Gilchrist writing about getting down on the floor to play with her books. I want to find that passage. With my coffee in one hand, I begin to pull her books off the shelf. I think it’s in Falling Though Space, her journal, but I can’t find it. Next I thumb through The Anna Papers. It’s driving me crazy. I’m not saying it’s not in either of these books, but I can’t find it. Now I’m down on the floor, surrounded by every book Ellen Gilchrist has ever written. When I find the passage that started this lovely side journey, I will let you know.